While the concept of my project has stayed the same, there has also been major developments which have happened due to a combination of areas. While researching and writing my research paper I had begun thinking more about life, linking aspects of metaphysical/ontological inquiry, nature and chaotic systems together. I started filming natural generative elements of nature, and especially enjoyed the filming process, whilst observing pattern transformations within the movement of ocean waves and the shoreline patterns. One of my favourite videos that I filmed so far is: Drift Line Sand Patterns It is very calming and the pattern transformations appear more vein like towards the end. This also coincided with an earlier post about a documentary called The Beauty of Chaos In this post there is a video excerpt of a documentary which explores ideas of a mathematician called Benoit Mandelbrot, looking at how natural fractals in the world form the shapes of mountains, coastlines and river basins; the structures of plants, blood vessels and lungs. I found this all so fascinating and it led me thinking more about our lungs and breathing, and the connection between our bodies and the natural world. This led me in the direction to experiment recording breathing sounds. Also the idea of using balloons has come from a friend. When she was pregnant she would often compare herself to a balloon. This gave me the idea to start experimenting with balloons. Ideally I would like to use a number of big clear balloons with a smaller balloon inside. The reason for using clear balloons are so I can also project a video of a collection of natural generative elements through them, to express the links between our bodies and the natural world simultaneously. I have also been thinking about the equations that Benoit Mandelbrot discovered, and have pondered the the idea of projecting actual equations through the balloons, but that didn't feel right as I want to visually express the real natural world in the projection. Though I do think the maths is fascinating, but mathematics is a human concept to describe the natural world. I want to visually show the real natural world in contrast,with using balloons and breathing sounds to symbolise human life forms to express how patterns of life are all connected. The big balloons with smaller ones inside would visually symbolise the creation of an individual within a system, or a reflection of an individual within the system of the world. Some of the big balloons would also contain a small quantity of air from an individual, and I would also include the recorded breathing sound of that person in the audio to be played with a collection of breathing sounds played randomly. I now need to do a lot of work on all these ideas through experimentation with balloons, pressure, methods for collecting peoples air and the transferring of air for an exhibition. Along with putting together a video for projection and collecting much more clearer breathing sounds from people than I have at the moment. While this week's chat covered quite a few interesting topics, I have decided to dedicate this post to Wikipedia. 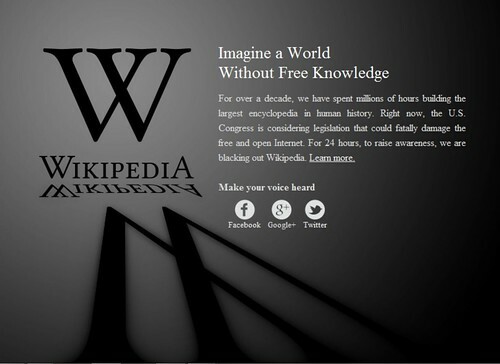 Wikipedia is today protesting against SOPA and PIPA by blacking out the English Wikipedia for 24 hours. SOPA and PIPA represent two bills in the United States House of Representatives and the United States Senate respectively. SOPA is short for the "Stop Online Piracy Act," and PIPA is an acronym for the "Protect IP Act." ("IP" stands for "intellectual property.") In short, these bills are efforts to stop copyright infringement committed by foreign web sites, but, in our opinion, they do so in a way that actually infringes free expression while harming the Internet. Detailed information about these bills can be found in the Stop Online Piracy Act and Protect IP Act articles on Wikipedia, which are available during the blackout. GovTrack lets you follow both bills through the legislative process: SOPA on this page, and PIPA on this one. The Electronic Frontier Foundation, a non-profit organization dedicated to advocating for the public interest in the digital realm, has summarized why these bills are simply unaceptable in a world that values an open, secure, and free Internet. From Wiki, click here to learn more. I believe that the general consensus of the group were that these bills should not be allowed to get through. They are an infringement on rights of expression; and will have a disastrous effect on the internet. This is not the way forward for the future of the internet. Since I've been getting asthma lately, I decided to use to this opportunity to record my breathing.